Toronto, ON: Doubleday Canada/Random House of Canada, 2014. 357 pp., hardcover & epub, $19.95 (hc.). ISBN 978-0-385-67931-2 (hc. ), ISBN 978-0-385-67932-9 (epub). "I don't have the money, Mr. Sherwood. And I won't be able to get hold of it by tomorrow." "Ah," said Sherwood. He sounded disappointed that I'd cut short the foreplay. "My lawyer's disappeared, and she had access to my accounts." "That's one I hadn't heard before," said Sherwood. "But how exactly is it my problem." I took my wallet out of my pocket, tugged my credit card from its pocket and offered it to Sherwood. He looked at it as if his new kitten had brought him half a rotten rat from the garden. "There's nearly nine thousand pounds in that account," I said. "Eight and a half," I admitted. Nicky had set it up for me so I would always have access to some cash, and I'd rarely taken out more than forty quid a week - I hated having more than that in my wallet. I did wonder why Nicky hadn't cleaned out that account too, but then she had been in a hurry. "The PIN is six-seven-four-three." "And you expect me to go to some machine outside a supermarket and stand in line to collect the money you owe me. Is that it?" "I'd give you all of it now, but my lawyer has to countersign the cheques." "And what's to stop you phoning your bank and getting that card stopped?" "I'm not going to do that. I'm not stupid," I said. "Really? Because that's not the impression I'm getting." Incinerator continues the story of 17-year-old Finn Maguire that was begun in Crusher. In this mystery and thriller blend, once again Finn seems to be a magnet that attracts only trouble. Since readers last encountered Finn, he has opened a boxing gym in partnership with Delroy Llewellyn, the man who had taught him how to box. The novel's initial problem derives from Delroy's not having had the money to pay for his half of the gym's cost. Delroy had chosen to borrow it from John Sherwood, the local loan shark, who is now sending his goons to collect from Delroy who has become delinquent in his payments. Upon discovering Delroy's situation, Finn, flush with monies from his inheritance, decides to pay off Delroy's debt, and he offers Sherwood twice the amount Delroy borrowed, with the full payment to be made in two days. Because Finn is a minor, his cheques have to be co-signed by his lawyer, Nicky Hale, but when Finn goes to a scheduled meeting with her, it appears that she has absconded with her clients' funds, including his, and has abruptly fled the country. Though Finn would be reimbursed by the Law Society within a month, he needs his money now! Finn, always the amateur detective, undertakes to find Nicky and to ascertain what would have caused her to flee so precipitously. Recovering his money is Finn's secondary motive. Though Nicky is a decade his senior and is married (unhappily), Finn has a crush on her and thinks his unspoken feelings might possibly be reciprocated. And so the roller coaster plot begins as Finn tries to identify who could/would have had a reason to want, or cause, Nicky to disappear. The cast of suspects is large and begins with Harry Anderson, Nicky's wealthy husband who is also a cocaine user and serious gambler. There are also two of Nicky's clients whose trials are scheduled to begin soon and who, for some yet unknown reason, might want their trials to be delayed. Like a good magician, a mystery writer uses misdirection in performing his plot magic. Consequently, not all of the Leonard's characters are who or what they initially appear to be to Finn (or the book's readers). Just as occurs in a novel by Charles Dickens, readers can never really let go of a Leonard character as s/he can turn up again and in most unexpected ways. 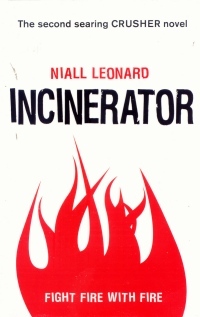 Leonard concludes Incinerator quite brilliantly because it both ends - and doesn't end. Readers will be left eagerly awaiting Leonard's next Finn Maguire tale. Leonard obviously likes one-word noun titles, but, as was the case with Crusher the title's connection to the plot is not immediately obvious. In the case of Incinerator, the title connects to an incident wherein Finn is almost incinerated when his gym becomes the target of an arsonist. Given that the book is set in London, England, and was originally published in the UK, it is not then surprising that it includes a number of British terms or phrases that may be unfamiliar to Canadian teens. Perhaps the Canadian publisher could have added a brief glossary to translate some of them, such as "saloon car" (sedan), "coach station" (bus depot), "boot" (trunk of a car) or "big shiny Merc" (vehicle made by Mercedes-Benz).